After many months of green abundance and tomatoes galore, the season is naturally starting to slow down. We have experienced extreme dryness and drought conditions this spring, which are bringing the “summer” season to us a few weeks sooner than usual, perhaps. So, this will be our last Monday farmstand for this season. We will only be open for an hour this afternoon, from 3-4pm. (We will be open regular hours Wednesdays and Saturdays for another month or two, then just Saturdays through the summer!) We have small amounts of salad greens, tomatoes, basil, garlic chives, onions, and giant zinnias today. And from our partner I-Sha we will have vegan ice cream in a virtual rainbow of different local fruit flavors! Thank you as always for your support of local farmers and producers, and local artists! Farmer Luca harvesting herbs. The zinnias have gotten to a pretty ginormous size this week! Treat yourself to a few happy blooms for spring! 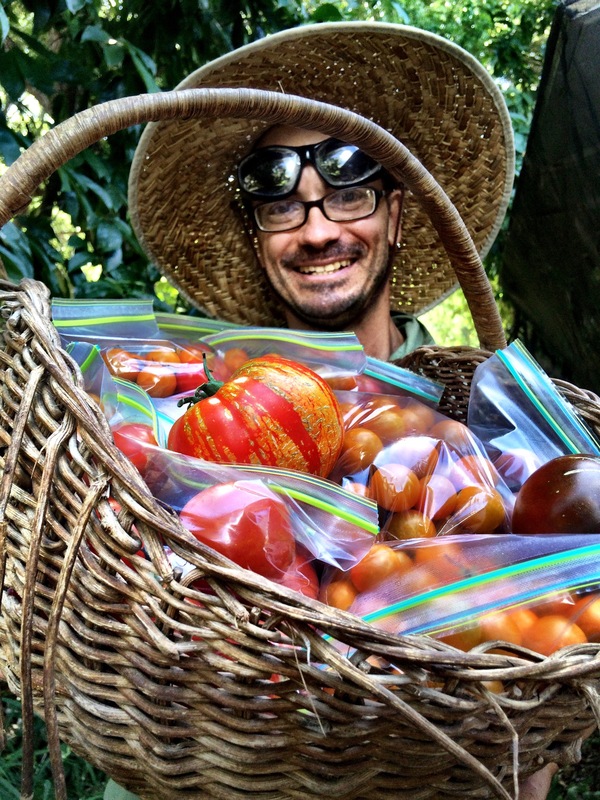 ARTfarm Wednesday, 3–6 p.m. Tomato Time! It’s a Wednesday that feels like a Monday. We are open 3–6 p.m. today, and the theme is tomatoes, crazy tomatoes! Also: sweet salad mix, spicy salad mix, arugula, microgreens, sweet corn, cucumbers, loads of cherry tomatoes, lots of slicing and heirloom tomatoes, radishes, escarole, kale, lettuce heads, cilantro, dill, mint, basil, lemongrass, chili peppers, passionfruit, and zinnia flowers. For our gardening friends, we are offering beautiful starts: cherry tomato seedlings and pineapple slips! From our farm partner I-Sha today: all natural, locally collected ingredients, coconut creamy vegan ice cream in quickly disappearing flavors: banana, soursop, and beet-ginger! Sweet and Spicy Saturday at ARTfarm 10am Today! Season’s Greetings! 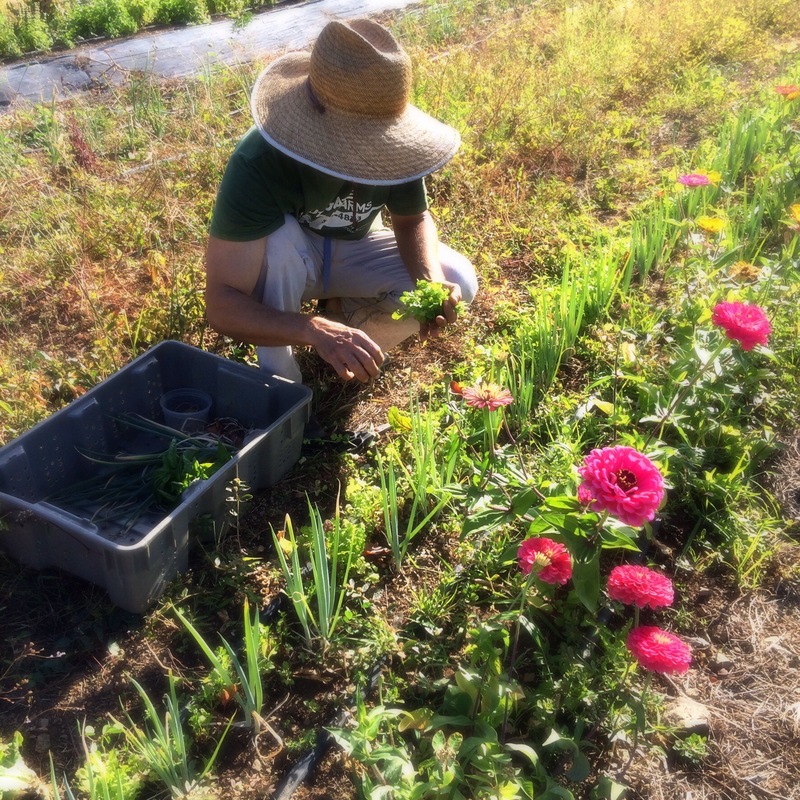 Saturday ARTfarm holiday goodies, 10am – 12 noon: sweet salad mix, spicy salad mix, all sizes of arugula, itty bitty microgreens, crisp cucumbers, two types of radishes, beets, cheery cherry tomatoes, kale, sweet potato greens and lettuce heads. Plenty of freshly picked herbs: Italian basil, lemon basil, cilantro, recao, mint, garlic chives, rosemary, dill, ginger, chili peppers, lemongrass and holy basil. Rumor has it that lemongrass is effective in the treatment of chikungunya symptoms. Luca also has selected pineapple and vegetable starts available for your garden. For your holiday gift list, why not a bunch of exuberant fresh zinnia flowers, a pineapple or basil plant that you pot up yourself in a pretty pot, or a bunch of sweet bananas. ARTfarm gift certificates are also available. From our partners we have the last of the ripe, juicy mangoes for this winter season from Alex at Tropical Exotics, petite (perfect stocking-stuffer-sized) honey bottles from Errol Chichester, and we have big “Marcus Pumpkin” avocados from retired UVI fruit tree agronomist Aberra Bulbulla. We’ll also be open 12-4pm on Christmas Eve day (Wednesday, December 24th) and we’ll start up Monday farmstands again right after Christmas! We look forward to seeing you. 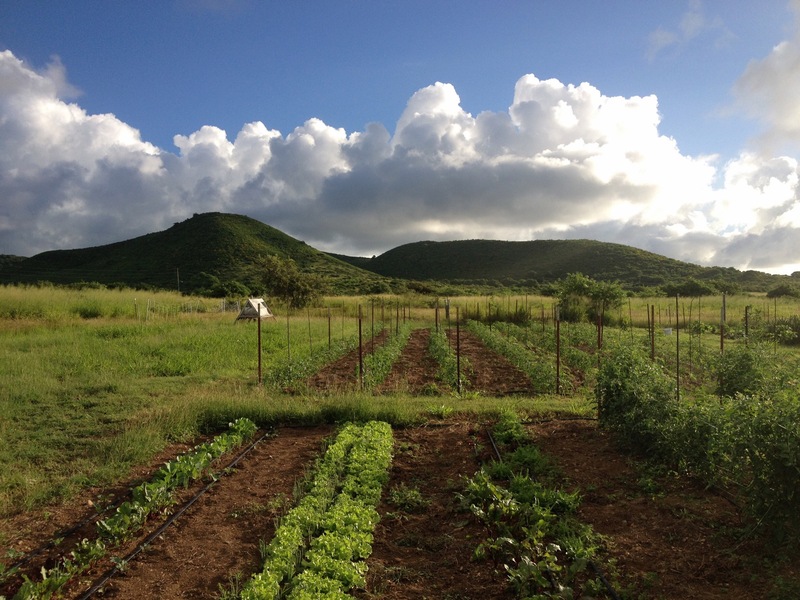 Thanks as always, for supporting small local family farms on our beautiful little jewel of an island. 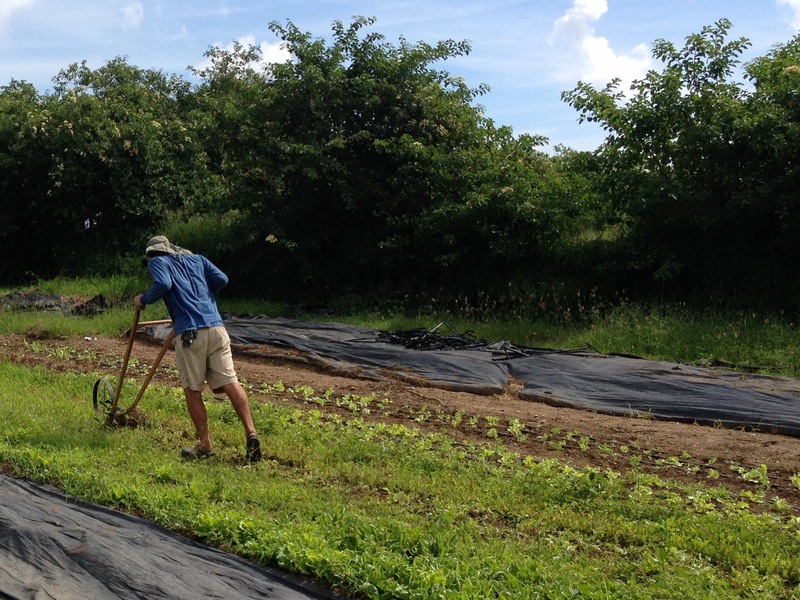 Having the privilege to farm organically in this place is a gift that our customers give to us year-round. Happy holiday season! Matthew loves cultivating with our wheel hoe. No fossil fuels required! Colors are so bright at this time of year on the farm. It’s a great season to be inspired artistically. This section of the farm has been grazed/graced by the ARTfarm sheep flocks for several years. This year, it is rotating in to be a productive powerhouse of tomatoes and veggies and herbs! Start stocking up for Thursday! Fresh for you, Saturday morning at ARTfarm: Microgreens, baby arugula, sweet salad mix, sweet potato greens, French breakfast radishes, Japanese radishes, cucumbers, fresh mint, Italian basil, lemongrass, recao, garlic chives, thyme, rosemary, passionfruit, a few dragonfruit, zinnia flowers, vegetable starts, pineapple slips, native trees and some young thin-skinned ginger root! From our partners: we have fresh Mahi from Ryan & Kim, vegan ice cream from I-Sha, honey from Errol, ridiculously amazing Nam Doc Mai mangoes and mamey sapote from Tropical Exotics, and avocados from Smithen the Cane Juice Man!! 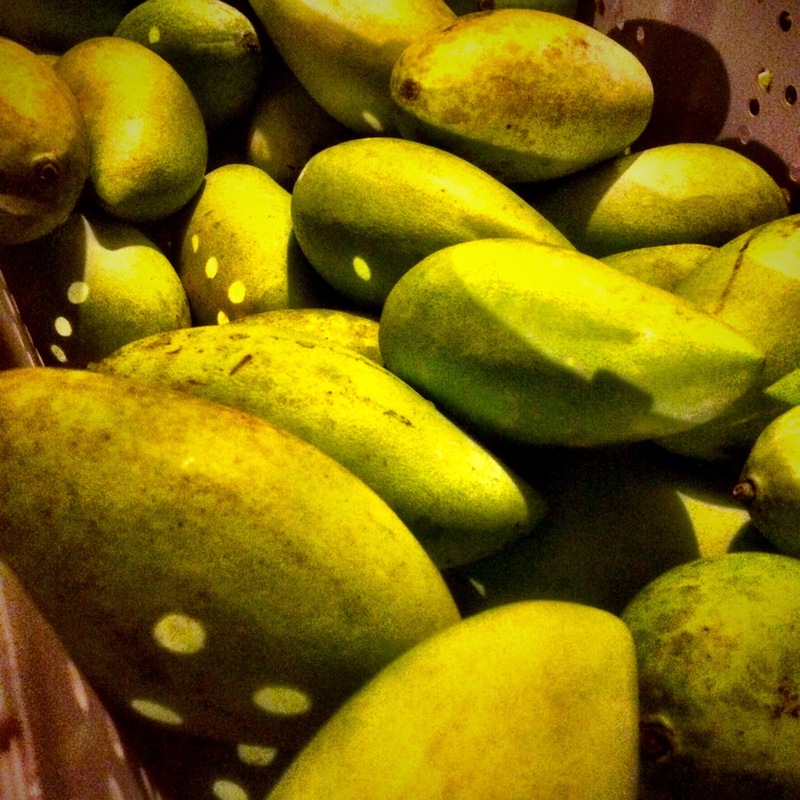 5am mangoes harvested and ready for the farmstand!